Another great thing about titanium is that it comes in lots of cool colours! This is done by anodisation, a process that colours the titanium without changing its biocompatibility. We have hundreds of different coloured titanium belly bars but theses are three of our top sellers. You can get almost any colour of titanium and our range includes sweet designs like these heart-shaped jewels. Titanium picturebell belly bars are a great way to make a statement. These high quality belly bars feature a range of punchy designs, from rockabilly cherries to cute hearts and comic book graphics. 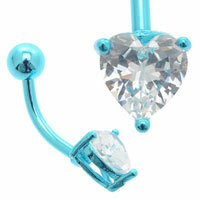 They are really bright and eye-catching, perfect for drawing attention to your piercing. The design is sealed with a special coating to ensure that it will not scratch or fade. This entry was posted in Belly (Navel) Piercings, Navel Bananabells, Titanium Body Jewellery and tagged Belly Bar, Belly Bars, belly button bananabell, Belly Button Bar, Belly Button Bars, Belly Button Ring, Belly Piercing Bar, Belly Piercing Bars, Belly Piercing Jewels, Belly Ring, Cute Belly Bars, Cute Belly Rings, Navel and Belly Button Jewellery on January 3, 2012 by Piercing Guru.